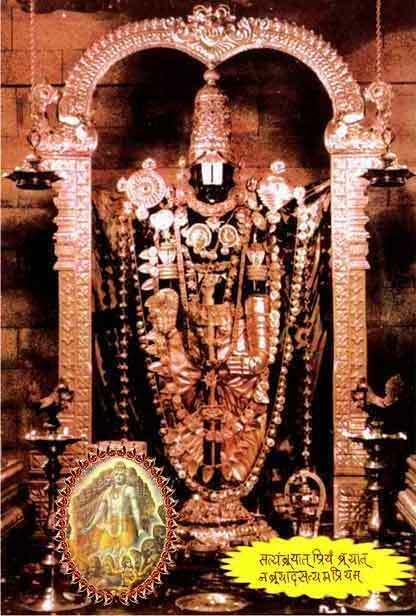 There are various Sevas and Seva Darshans of Lord Venkateswara Swamy of Tirumala. Suprabhata Seva is one such seva / darshan which is the wake up pooja of Sri Venkateswara Swamy. It starts with the divine chanting of 'Kausalya Supraja Rama Poorva Sandhya Pravartate' at Bangaru Vakili in front of the main deity. Devotees can have the Suprabhata darshan of Lord Venkateswara from 3.00 a.m onwards after the seva which lasts for 30 minutes from 2.30 a.m to 3.00 a.m. This seva is not performed in Dhanurmasam as Tirupavvai is recited during this time. Pilgrims / devotees can book the tickets online for Suprabhata Darshan from the official website of TTD (Tirumala Tirupati Devasthanams) - www, ttdsevaonline.com. Tickets can also be booked one day in advance from the Single Window Counter opposite to CRO (Central Reception Office), Tirumala. The seva is performed on all the 7 days of the week. Cost of the ticket: Rs.120/- per person. Pilgrims get two small laddus for each ticket purchased. They can collect these laddus at the laddu counter. Pilgrims with Suprabhata Darshan tickets should report at Vaikuntham Queue Complex - I by 2.00 a.m in neat and traditional wear. Men should wear traditional white dhoti and shirt / upper wear and women should wear sari / half sari or salwar suit. You need to sit / wait in some corridors / sheds till 2.30 a.m.
By 2.30 a.m, pilgrims are allowed to go inside after thorough verification and check up. Pilgrims need to carry the printout of the ticket. They should produce their photo id proof at the time of checking. You need to produce the same photo id proof which you used at the time of booking the ticket online. Free entry for children below 12 years. However, you need to produce the age proof to avail free entry. No proper line is followed but pilgrims just run / rush in view of reaching the main temple first. It's a short walk to reach Bangaru Vakili i.e the main Garbha Griha. Do not carry your mobiles, it's strictly prohibited. Do not go in Western outfits. Do not rush in the lines. Every pilgrim with a ticket will get the chance to have the darshan. Have bath / shower before going for Suprabhata Darshan. Pilgrims with children be prepared for long waits. Get woolen ware during winter. Finally do not book tickets through brokers / middlemen. Note: It is not easy to get the tickets. You need to book the tickets well ahead. If not online, you can also book the tickets at the TTD counters / Kalyana Mandapam at your location / city. Be patient to have the Suprabhata darshan of Lord Venkateswara and have His blessings.